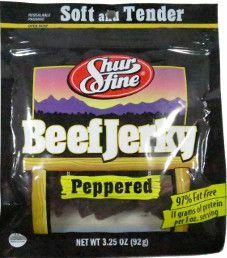 This review will focus on a 3.25 ounce/92 gram bag of Shur Fine beef jerky. Back in December 2014, while getting off the i81 interstate to fill up with gas, this bag was purchased at a store named Greggs Market Place. They are located in a small city named Marathon, New York. 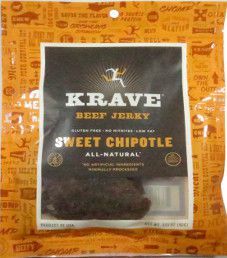 The next review for KRAVE Jerky will be on a 3.25 ounce/92 gram bag of their sweet chipotle flavor. This bag was graciously submitted by the KRAVE team. The next review on Steve’s PaleoGoods Jerky will be on a 1.4 ounce/39 gram bag of their buffalo style flavored chicken jerky. 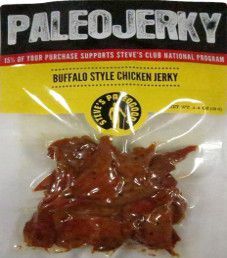 This jerky was kindly submitted by the Steve’s PaleoGoods team. 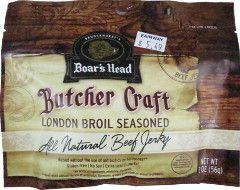 The next review on Boar’s Head will be on a 2 ounce/56 gram bag of their London Broil Seasoned beef jerky. This bag was purchased in December 2014 at a Fairway grocery store in Woodland Park, New Jersey. 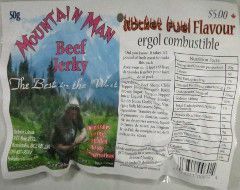 The next review on Mountain Man will focus on a 1.8 ounce/50 gram bag of their rocket fuel flavored beef jerky. 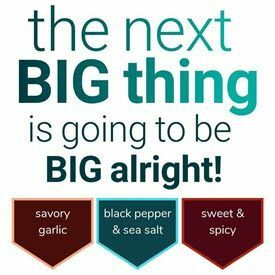 Of the six types of hot flavors that Mountain Man offers, this rocket fuel flavor is the second hottest flavor. This bag was graciously submitted for review by the founder of Mountain Man, Robert Lahue.